That is lovely , deserve to be nominated. Fabulous Denise . . . what an inspiration! That's looking great Denise,the excellent planting really sets it off and makes it look very natural.Well done! What a delightful photo Drc. and such a pretty garden. Thanks Geranium and Grandmage there are some lovely frogs in and around it. I am glad you are enjoying it Earthchild. It doesnt look too bad. this is the sort of thing I aspire too, but end up with lots of half done bits or the bits sorted get out of control. It's all been said - it's beautiful, and the shaping of the whole area is lovely. Really like your pond and your planting! 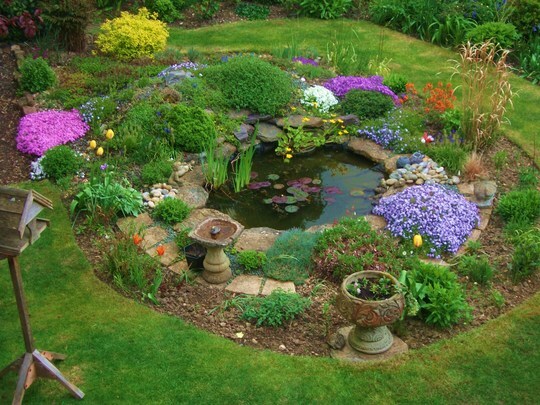 I've been thinking of doing a pond for years now and that's exactly what id like, very well done love it. Thanks Scotsmanvic I dug this myself in January 1999 and have loved it and how it attracts widlife the only thing I would have done different is to make sure the shelf area was flat and not all the way around. I would love it to be twice the size but 8 feet across and 4 foot deep was all I could manage by myself.